Do you say sCAL-lop or sCALL-op? Turns out there is no debate. Years ago, when I was the best man at a wedding in Lunenburg, Nova Scotia, a life-long scallop fisherman – and the father of the bride – set the record straight for me and threatened bodily harm if I ever said scallop wrong again. And I never have. I only wish I’d spent that weekend paying attention to how the scallops were cooked instead of practising my diction. They were perfect – bacon-wrapped or butter-soaked – straight off the boat. Creamy, barely cooked centres, the tops and bottoms caramelized just right. They didn’t last long (neither did the marriage, but that’s another story). Sadly, my own early attempts to recreate that feast at home produced little more than rubbery lumps that were hardly worth eating no matter what I called them (and I called them a lot of things that can’t be printed in a family blog). Now that I know that cooking them correctly is almost as easy as pronouncing scallops the right way, I regret waiting so long to make them regularly at home. Served over buttered egg noodles, they are a quick and surprisingly filling week-night meal. On their own, they are a fast first course for a dinner party (and you can lecture your guests on pronunciation). I have to admit I learned the trick (exact timing, a non-stick pan and butter basting) from Cook’s Illustrated, which is not nearly as cool as learning it from a scallop fisherman. But they taste just as good. Oh, and it’s sCALL-ops, not sCAL-ops. Don’t ever forget it. Heat a small pan over medium low heat. Melt butter and cook, stirring or swirling the pan frequently to prevent the butter from burning, until it just starting to turn golden brown (4-5 minutes). Add the shallot. Cook about 30 seconds,add parsley, thyme and lemon juice. Stir and set aside. Place scallops on paper towel for a few minutes to dry, turning occasionally. Season scallops with salt and pepper on both sides. Heat a large non-stick sauté pan to medium and add oil. Add scallops, being careful not to crowd. Sauté for 90 seconds on the first side. Using tongs1 turn scallops quickly. Add butter. 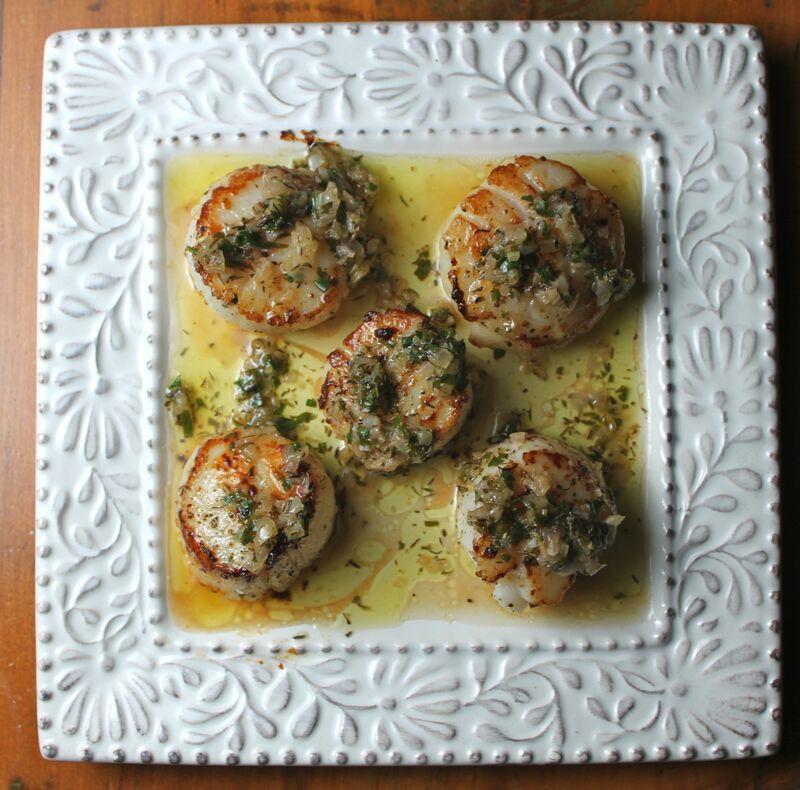 Tilt pan slightly and using a tablespoon, baste the tops of the scallops with butter baste. Sauté on second side for 30 t0 60 seconds. Scallops should be browned on top and bottom. Serve drizzled with sauce. Enjoy. This entry was posted in Appetizers, Fish and Seafood, Main Courses. Bookmark the permalink. Oh my. You’ve done it again. Thanks!That’s the first time I ever felt sorry for Italians when it comes to food! This looks amazing (and uncomplicated), Scott. We will be trying it out at the Manse very soon. Meanwhile, thank you for saving me from myself when it comes to the pronunciation of scallops. I’ve been saying it wrong all my life – yikes! They really are (good and uncomplicated). I hope they are enjoyed at the Manse as much as they are here!